On July 10, 1943, the 180th Infantry Regiment made its debut into the war when it landed at H-Hour in the vicinity of Bicari, Sicily. For three bitter days the regiment fought against elements of the crack Hermann Goering Division until it captured the town and airport of Biscari, thus enabling our forces to secure an air base for future operations. Pushing on from the airport, the doughboys of the 180th seized Caltigironi, Sicily's largest inland city and a Fascist stronghold, and then continued their advance so rapidly that by July 22nd, a patrol from the I&R platoon of the regiment entered Palermo in advance of other American forces. From Palermo the advance swung east along the coastal road between Cefalu and San Stefano. In most places the attacking troops were faced by the sea to the immediate left; in the center and just above the sea a narrow coastal road, while to their immediate right jagged cliffs and mountains hemmed them in. Under constant German artillery fire and counterattacks, the regiment advanced to the junction of the coastal highway and the road leading south of San Mauro. It was here that the coastal town of Castel Di Tusa was seized and the Battle of "Bloody Ridge" fought. It was the successful seizure of this coastal road, one of the main approaches to Messina, that contributed to the early fall of that Sicilian seaport, and the conclusion of the campaign. 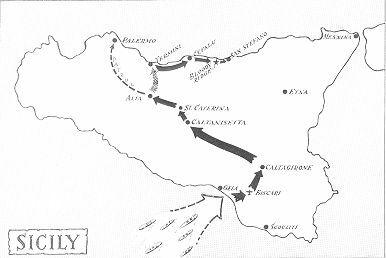 The Sicilian Campaign was characterized by stiff German resistance, with little or no opposition from the Italian troops. It was here that the regiment acquired experience both in amphibious and mountain operations which was invaluable in future operations.